All requests for procurement of goods or services must be submitted on a purchase requisition. The purchase requisition must be completed and approved through the CFS requisition process. A purchase requisition is not an authorization to make the purchase, only the official request to Contracts and Procurement to issue a purchase order. 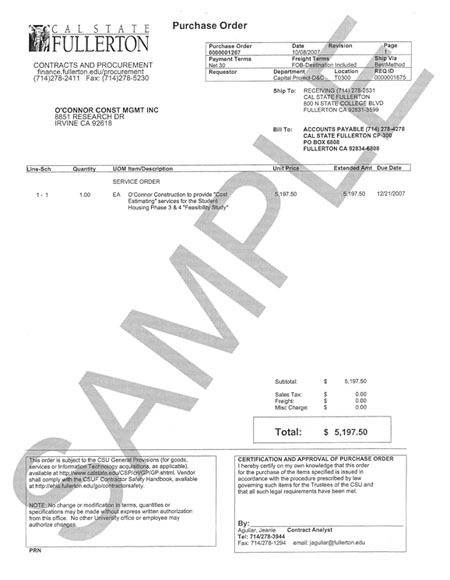 Below is a sample of a CFS purchase requisition. A purchase order, issued through Contracts and Procurement, is the official agreement (i.e. legal document) between the University and the vendor to provide the goods and/or services. 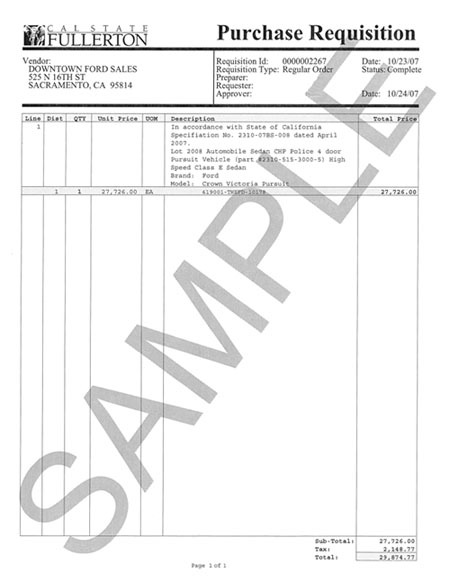 Below is a sample of a purchase order. A change order is a form used to request a change to an existing purchase order. The change order must be complete and have all appropriate approvals before being submitted to Contracts and Procurement, CP-300. A change order is not to be used as a substitution for the purchase requisition process. The following programs delegate a very specific procurement authority pursuant to the policies and/or procedures of the specific programs. Procurement Card Program – The procurement of goods and limited services allowed by the Procurement Card Policy . Office Supply Program – The procurement of office supplies and furniture offered through the OfficeMax Online Catalog pursuant to the Office Supply Program Procedures. Procurement of goods and/or services made by department personnel outside the authorized procurement methods (purchase requisition, procurement card, & office supply program) can be considered a personal obligation of the individual making the purchase and not an obligation of the University. 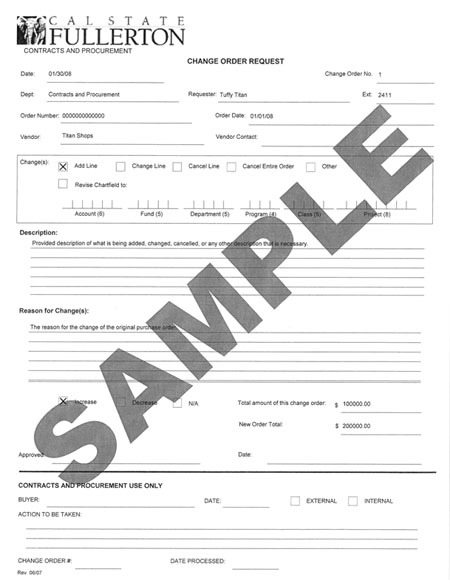 Persons wishing to submit a request for the University to accept the obligation for payment, must submit the request to Contracts and Procurement on the Unauthorized Purchase Approval Request form . Submission of the form does not guarantee approval of payment. Contracts and Procurement may approve or deny the request. Until notification of approval, the purchase is considered the obligation of the individual.